Often the first sign of a carpet beetle infestation is the presence of adult beetles on the inside of window sills or climbing the walls. There are several species of carpet beetles, but the most common species that we are asked to deal with at Kestrel Pest Management is the variegated carpet beetle (Anthrenus verbasci). The adults are 2-3mm long, the wing cases and thorax are coloured white, yellow, brown and black that produces an irregular pattern. They have very short antennae that have a clubbed appearance. These adults are quite harmless and live outside feeding on pollen and nectar. It is the larvae of carpet beetles that do all the damage. The larvae are 5 mm long, have dark bands and are covered in short bristles. This hairy appearance is why they are known as ‘woolly bears’. These larvae have a voracious appetite that require a diet that is rich in the animal protein keratin. So carpets, rugs, clothes and soft furnishings are all at risk of attack from these carpet beetle larvae. Typical carpet beetle damage to fabrics includes bare patches and irregular holes that sometimes connect to leave large holes. Soiled fabrics are much more prone to attack. The life cycle of carpet beetles begins when the mated female adults seek out a place to lay their eggs. They are looking for any site that offers a rich keratin-based diet. The infestation can begin when adults fly directly inside our homes and find a suitable material or it can begin when the female chooses birds’ nests in our eaves and roof spaces as an egg laying site. 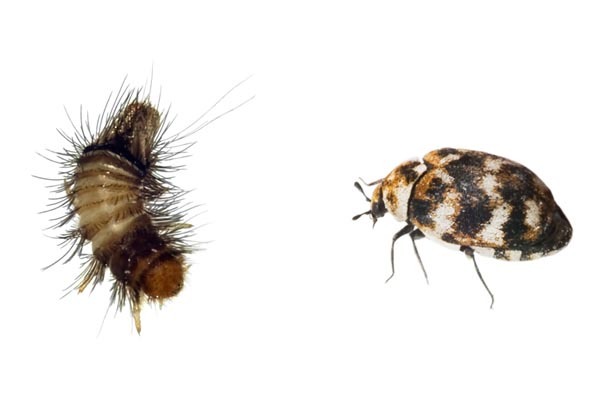 Significant carpet beetle infestations can build up in birds nests, and when their source of feathers and nest detritus is depleted, they will migrate into our homes to infest other materials. Eggs: Each female can lay up to 100 eggs that hatch in around 14 days. Larvae: The larva undergo 5 moults that lasts occur over several months depending on the temperature and food source. Pupae: The pupation stage lasts around 10 days after which an adult carpet beetle emerges. Adult: The adults are short lived and concentrate their time outside feeding on pollen and nectar and seeking out a mate. The key to the eradication of carpet beetles is to identify the source of the infestation. This is quite often hidden and can be under carpets, between floorboards, under furniture and so requires a thorough survey by a professional. 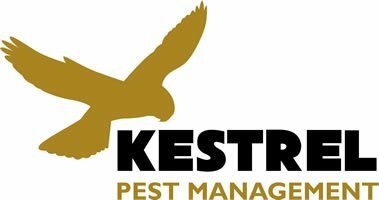 At Kestrel Pest Management we are experts in the control of insect pests and use the latest products and techniques to ensure the successful eradication of any carpet beetle infestation.